Weekly we wrestle with what to offer as a new product. We brainstorm what most customers can find online and identify gaps. We came up with the following things: t-shirts, jewelry, wristbands, mugs, and the other more common things that come up on a Google search. So we knew what was not being offered. We thought that what was needed was home decor that was of fine-art caliber. That was an area that was not being met. But we began with the end in mind, like everything else that we do. So we set out a few goals. We wanted our customer to be able to afford a fine-art product, be satisfied with the construction and quality of the products, and be over-joyed with what they eventually will hold in their hand and show those around them. We designed a couple of products that we thought would resonate with them. Using paper and pen, we sketched out a concept of what we wanted to create. We thought their culture and family name were very close to their heart, so we decided to target meeting these two areas. We brainstormed and asked ourselves, what can islanders choose as a fine-art piece that speaks of their island home, or in some cases their family and clan names (in Guam, family names are further broken down into sub-clan names using a term that distinguishes one branch of a clan from another). This is sort of like creating categories of families within clans. So we can up with a design where we’d panel 16 of our choice illustrations of Guam, and create a center piece that essentially and literally pops creating a shadow effect. The two examples we came up with were our Guam-themed and Custom Name two-stack plaque. We wanted to create some pretty substantial fine art pieces that islanders can be proud of displaying in their homes and offices. We worked with production to bring this to life, and we were absolutely blown away with not only its clarity, vividness, and clean feel, but also its beauty. 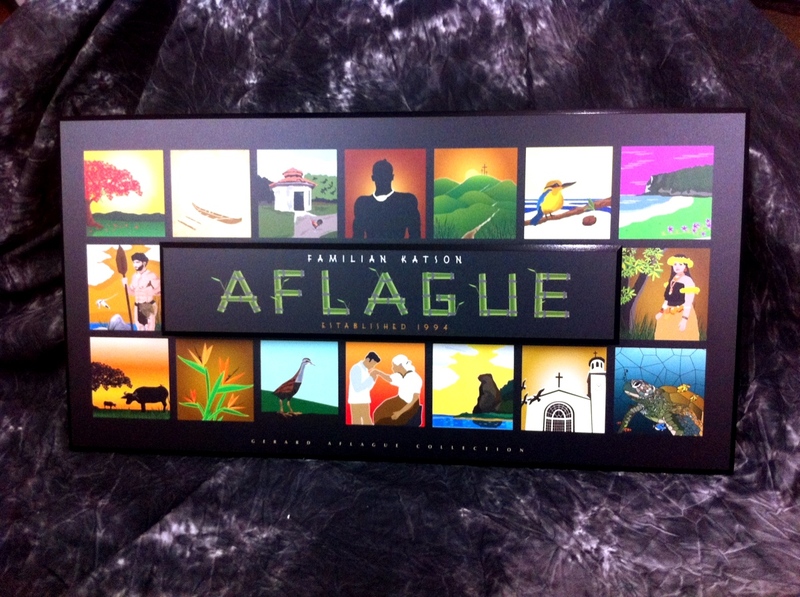 We were so happy with it, we felt that we could easily begin offering it for sale. So in these two images, we present what we now have available. They are both sized at 11 x 22 x 1 inch in dimension, and weight approximately 4 pounds. They can be wall mounted with provided hardware, as well as propped on an easel and displayed on a table top. While these are substantial in size, we are considering coming up with a smaller size that is priced less. 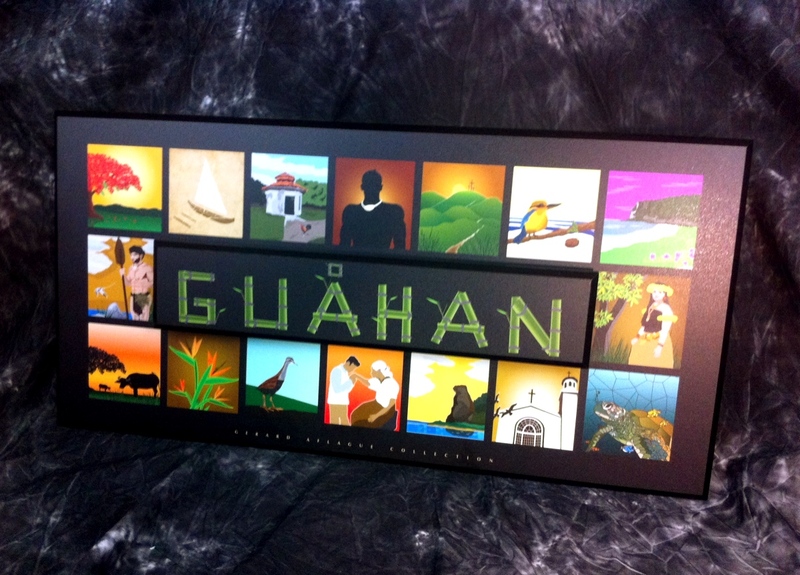 This first product is a generic Guahan plaque that exemplifies the essence of Guam in picture. With a bamboo motif font, the word Guahan is set on center and is raised about a half-inch from the bottom plaque. This second product is a customized family name plaque. We offer customers the ability to place their family name, and if they desire, their Chamorro family branch name, and the date their own family was established (or in some cases, the year that their family name or clan was established, which could be hundreds of years past). As you can see, both of these pieces are not only bright and vivid, but they also are a lifetime family heirloom. We scoured the United States to find what is essentially the best plaque company in the nation with the most superior quality construction and someone we were happy to work with. We are happy to say that we found that partnership. And because of our relationship, we now can say that we will be offering an array of plaque products for customers that expect the very best in what they purchase.